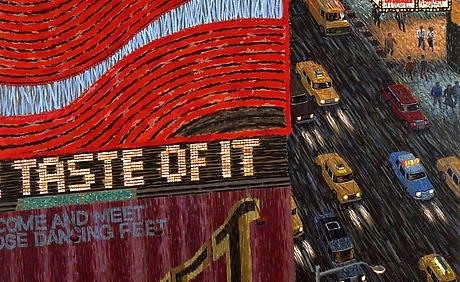 City As Muse: Rackstraw Downes, Joyce Kozloff, and Ethan Ryman in Conversation with Moderator John Zinsser at DC Moore Gallery from DC Moore Gallery on Vimeo. JOHN ZINSSER is an abstract painter whose drawings are featured in Paved Paradise, currently on display at DC Moore Gallery. Zinsser lives and works in Brooklyn and teaches at the New York Academy of Art and The New School. His work is included in major public and private collections in the United States and abroad. RACKSTRAW DOWNES is a British-born realist painter. His oil paintings are notable for their meticulous detail accumulated during months of plein-air sessions. In 2009 he was awarded a MacArthur Fellowship or “genius award.” His work is included in major public collections including the Museum of Modern Art, the Hirshhorn Museum and Sculpture Garden, and the Art Institute of Chicago. JOYCE KOZLOFF is an American artist commonly associated with the Pattern and Decoration movement she co-founded in the 1970s. She has been active in the feminist art movement as well as the peace movement throughout her life. Her work often deals with cartography and is included in major public collections including the Museum of Modern Art, Metropolitan Museum of Art, and the Whitney Museum of American Art.